Thank you to all who commented on my MMM Tea Party post! I think I'll copy that contest! Who's game? but who's this Evilum or Evilun? I had to find out, so I searched. Evilun (not um) hosted a weekly horror movie program called "Terror!" It aired Saturday nights on Ark-La-Tex TV station KSLA in the early 60's. "Evilun was portrayed by a very talented local actress named Ruth Sprayberry. and was a very kind and gracious person. I watched Terror! every weekend during junior high. 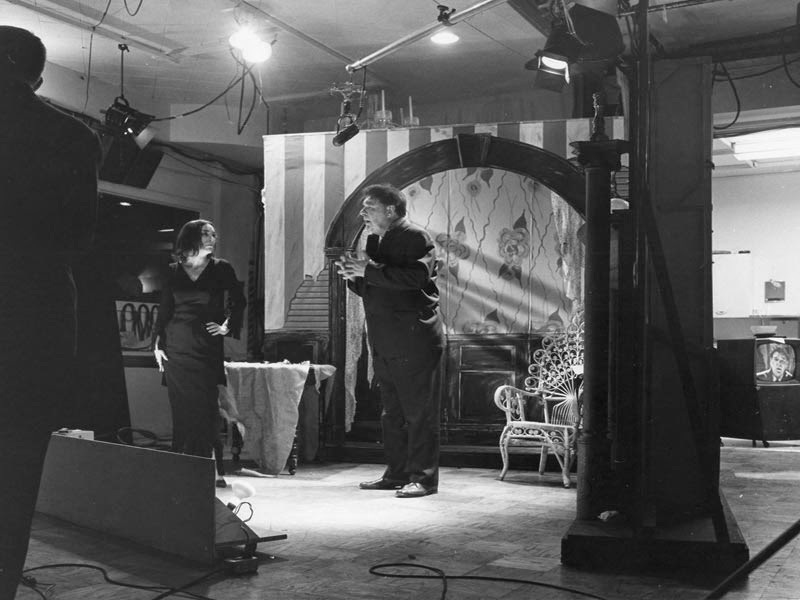 films like "I Bury the Living" and "Cry of the Wolf". Evilun had a small creepy set with lots of dry ice fog and candles in ornate candelabras. and seemed to be having a grand time with it all. The Terror! program ran a few years. I worked at the same TV station as Graphics Director. 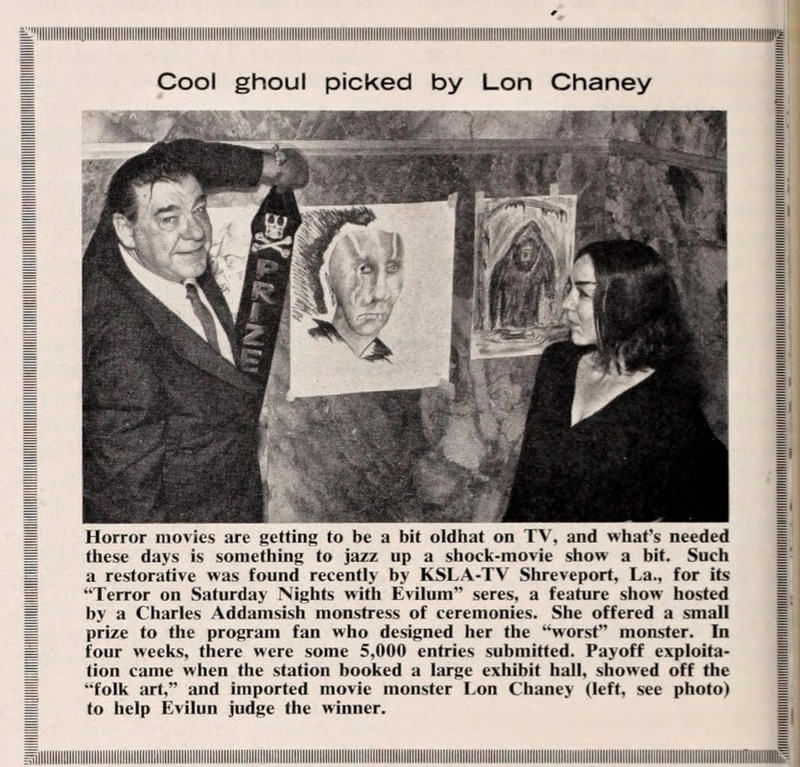 and a few with Lon Chaney. I found articles and notices about the "Design A Monster" art contest as well. though the station has had several owners since. It might be fun to try and track some of that down." so I'm going to share them! Wow! I'm intrigued, I really want to watch one of her shows now. Me too! If they were recorded, I hope someone puts them online. It was good to see Lon smiling. I heard he had a hard life. Cool. I love horror hosts. 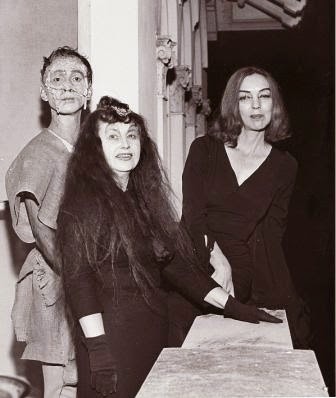 It's hard to measure up to Maila Nurmi, but they're all unique and individual, and seem to enjoy the gig! The San Francisco Bay Area's very own horror host in residence, Mr. Lobo, just released an homage to Halloween sound FX tapes today! True! 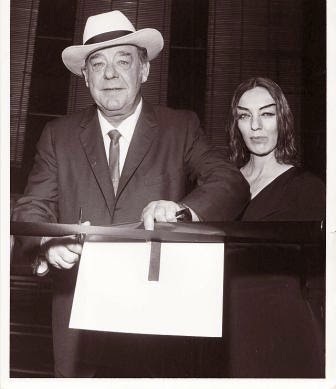 No host will outdo Maila/Vampira, but they're all awesome in their own way. I've heard of Mr. Lobo. Think he may be in my neck of the woods (VA) now? His album sounds cool. Thanks for the link! Fantastic photos! I love: "It's comforting to know there're so many of you sickies out there." Haha. Comforting indeed! 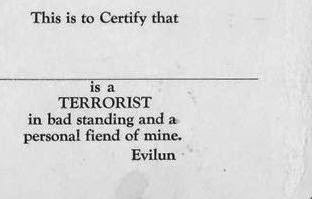 Bet they wouldn't be allowed to say: "This is to certify that __________ is a TERRORIST..." these days. I loved that too, but it definitely wouldn't fly today! Evilun looked very goth for the time didn't she. 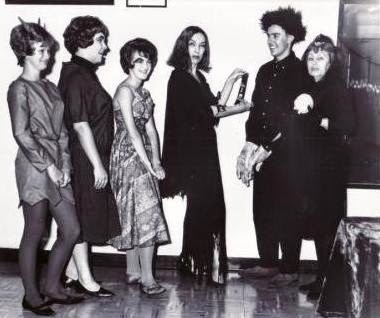 And here I was thinking that Morticia was the original goth girl! Thanks for sharing this info and these classic photos. Indeed, she did! Morticia was first though. In cartoon form that is. She's actually who Maila Nurmi based the Vampira character on. And you're quite welcome! Glad you enjoyed. Glad you enjoyed! :) I have a list of horror hosts whose show I never saw but would love to too! And it keeps getting longer as I hunt for more to post on this page every weekend. Some call it stalking, I call it love! ;) Thank YOU, Conrad! so cool you put this page up for my mom. Have been wanting to do something for her. Much appreciated. Thanks so much for the comment, Bobby! It made my day and your mom made my life, cause I met my boyfriend Conrad on this page. (You can see our convo above.) We're so grateful to her for bringing us together. I'd love to do another page for her, if you can provide me with photos, videos or audio recordings? I second Holly's comments Bobby as we thank your Mom for bringing us together!Please do share more items about your Mom if you have them! I grew up in Texarkana and used to love watching Evilun when I was a kid back in the 60s. 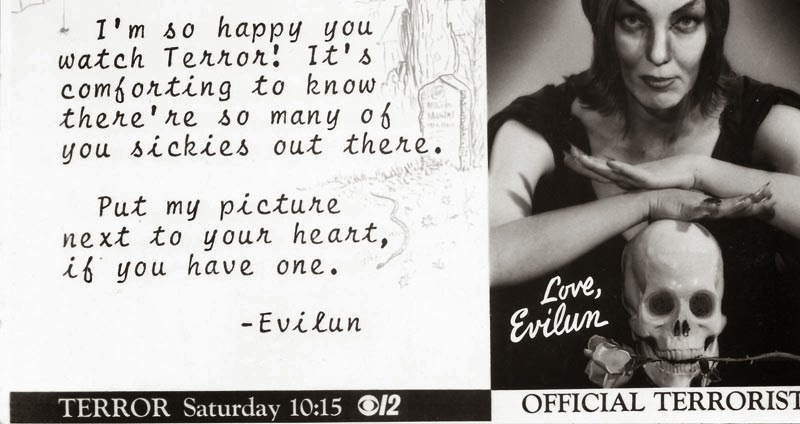 She also did an irregular Saturday afternoon show called Evilun's Bewitching Hour. When I say irregular it's because you never knew for sure when or if it would be on because of the time factor in live football games and other sports. Thanks for the info, Russ! I'd love to hear more about her shows. Wow. 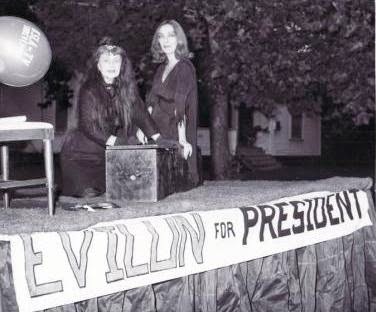 Some 5 1/2 decades after watching Evilun on TV as a preschooler (I grew up some 35 miles east of Texarkana & 70 miles north of Shreveport), I finally learn how her name was spelled. I thought I heard it as "Evila" as a child, & then I saw the great writer Joe R. Lansdale refer to her as "Evilyn" (if memory serves) in an essay about his own formative years growing up in east Texas, watching the Shreveport stations.